This will be a super short recap/summary -other Tavern writers will add to this as the day goes on. In a bit of a risky move, Paulo Bento opted to start Son Heung-min, who arrived Monday morning in the UAE not long after playing 90 minutes for Tottenham on Sunday against Manchester United. Seemingly shedding any signs of jetlag, Son added a decisively positive element missing for Korea and they notched a semi-comfortable win against China, leapfrogged above them and finished top of Group C. The result means that Korea, having been the first team to gather all 9 points possible in the group stages, took care of business and most importantly, get a vital 5 day rest (as opposed to 3 had they been runner-ups) before the Round of 16 begins. However, some dark clouds are gathering in the Korea camp as Steve Han reported on Twitter; Lee Seung-woo kicked a water bottle in frustration after realizing that he would not see any minutes to see out the game against China. Lee was called up at the last minute when Na Sang-ho was unable to play due to injury. Bento’s exclusion of the Hellas Verona player has raised eyebrows -particularly as a less-than-sharp Korea saw out narrow 1 goal marginal results against the Philippines and Kyrgyzstan. More importantly, there is concern that Bento, who has done tactically enough to get 9 points in the group stage, isn’t rotating players properly for the long haul – and in particular regarding their talisman in Son, let him linger dangerously for the entire game – only taking him off with 3 minutes left to go. With Korea looking comfortable with a 2 goal lead in the 2nd half – it was a baffling decision why Bento risked leaving Son out there for so long; he was tackled, stomped on and suffered minor injuries on 3 different occasions before finally getting substituted for Koo Ja-Cheol. The long shift also risks burnout (more on that later). It was a gamble that in some ways paid off for Bento; Son was directly involved in both goals. Korea will get a well deserved 5 days rest, however questions linger about Bento and his ability to oversee the long game in this Asian Cup tourney. C조 1위를 위해 필요한 것은 오직 승리! 2019 AFC 아시안컵 조별리그 3차전 중국전! Again a 4-2-3-1, this time Kim Jin-su replacing Hong Chul at LB, Kim Moon-hwan replaces Lee Yong (out serving yellow card suspension), and Son Heung-min replacing Koo in the hole. Immediately Son’s presence was felt keenly by China’s defense. In just the 12th minute, Son drove into the box, surrounded by multiple defenders, cut inside to find a sliver of space when he was hacked down by Zheng Zhi. Paulo Bento made a crucial decision (probably pre-match) to designate Hwang Ui-jo to take the penalties (see Asian Games for context). Hwang stutter-stepped in the run up to the ball, but couldn’t get keeper Junling to commit. He directed the shot left – but Junling guessed correctly and leapt to keep Ui-jo’s ball out! It was just an inch beyond his fingertips as Ui-jo did well to send it in to the far left corner and on into the net. Son and company kept on with the attack -and just as they had with their other 2 games, controlled the lion’s share of possession. The only difference was Korea looked sharper, moving the ball from the ball from the back to the front efficiently and calmly despite an intense forward-press from China. The entire backline led by Kim Young-gwon was unflustered and adroitly had the chops to get in and around their counterparts. The few times China came at them, the disciplined and unperturbed Korea defense did well to mop up. Kim Moon-hwan really raised eyebrows (except to those who watched his performance in the Asian Games) with his heads up play down the right, and later in the match had a poised fantastic run that had the entire Chinese defense in tatters trying to stop him as he changed directions – he came ever so close to scoring his first senior KNT goal but the ball went just wide of net. The battle for the midfield was won by a clever tag-team combo of Lee Chung-yong and Hwang In-beom (and to a degree Jung Woo-young), with technical skillfulness to create space (and more precise passing than in the previous 2 matches) to dominate the pitch. Meanwhile Son did his part drawing away multiple Chinese defenders -and in the tactical chessmatch of things, it thusly allowed space to open up for Hwang Hee-chan and Hwang Ui-jo. 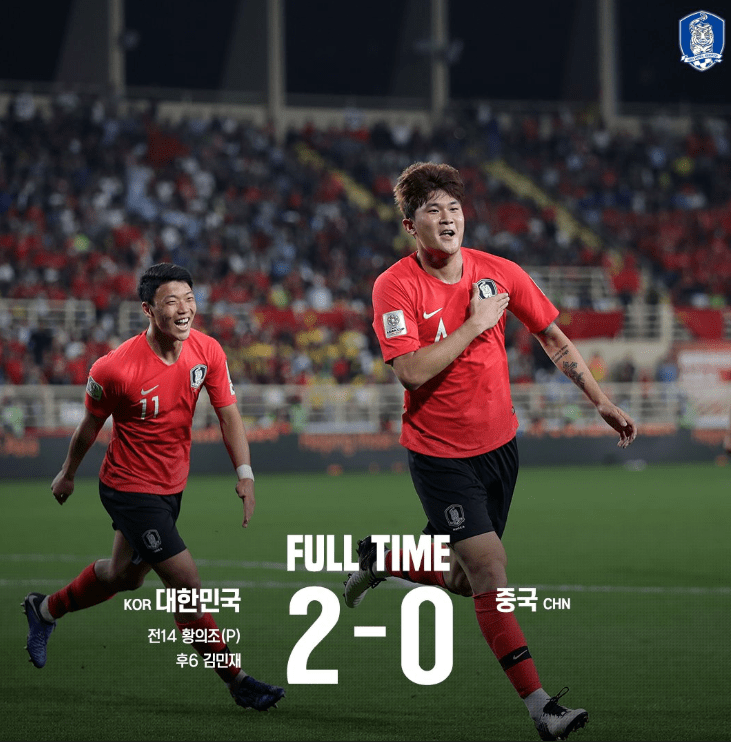 Despite decent on-target shots by the ‘Hwangs,’ Korea was unable to double the advantage until the 2nd half, where Son inflicted further damage. He whipped in a dangerous corner kick just 6 minutes after the restart, and Kim Min-jae, just as he did with his heroics against Kyrgyzstan, made himself invisible on the outside, until he could pounce. He ran towards the ball that was zipped into the middle and connected quickly before Zhou Xuri could spot the oncoming danger. Zhou was too late. Kim knocked it in with force and finally Korea got an insurance goal. Korea sapped the remaining hope China had, enough to see out the scoreline until the end. Of course that wasn’t the end of it: Son kept up the pressure on China’s beleaguered defense, driving in, finding outlets in an open Kim Jin-Su in the box on one occasion (his shot deflected out for a corner) and later to Hwang Hee-chan – a cheeky corner kick/pass that took the defense by surprise- but Hwang shot managed to reach the upper stands. Hwang Ui-jo practically walked in the Chinese area, but with multiple Korean attackers open in and outnumbering the split Chinese defense, Ui-jo couldn’t decide whether to shoot or pass – the ball was taken from him before he could make up his mind and the chance went begging. After Ji Dong-won replaced Hwang Ui-jo in the 70th minute (note: you would think Son and Ui-jo could both come off at this point), Son went up top to further cause conniptions to China’s backline. However by this point Son looked completely out of gas and didn’t have enough in the tank to pull out any more rabbit tricks from his locker, with several potent Son drives snuffed out by the defense. With the win and topping the group, Korea not only earn themselves 5 days rest instead of 3, they also travel less (R of 16 in Dubai, beyond that the rest will be in Abu Dhabi) and will likely have a less challenging road in the knockout stages as they will face the 3rd place team in Group A, B or F next Tuesday. 후반6분, 손흥민의 너무나도 깔끔한 코너킥! We’ll be back later. What are your thoughts on the final group C game for Korea? Bento is like Linus from Peanuts, and Son is his security blanket: he will never let go lol. Completely agree, once up 2-0 Son should’ve been taken out. I have a slight suspicion Bento might have wanted this game more than usual, both cuz of his CSL sacking, and cuz it was against Lippi, former WC winning coach. If so, juuust a tad/borderline unprofessional just my opinion. Even so, game was well in hand, why keep Son out there? No idea. And how bad can LSW possibly screw things up if you give him 15-20 min or so? Asked it before, is something up betw. him & Bento? And now w/ the bottle kicking incident (*gasp* insubordination! ), who knows how this turns out. Not sure if I’m missing something but no way 2-0 can be considered a safe lead. Let China score a goal with 20 minutes left and everyone would be biting their nails since China only needed a draw to top the group. Son seemed willing and probably expected to play every game for the full 90+ minutes. Regarding Lee Seung Woo, he has spent too much time in Spain where people are hot tempered and wear their emotions on their sleeves. Don’t think there is a need to interpret too much into it. 1) Since Bento took over, Korea has not lost a game. 2) Korea just finished top of their group, got 9 points, scored in each game, no goals conceded. Looked a hell of a lot better today than the first two games. 3) Korea avoids Iran until the final, and definitely avoids Japan until semi-finals at least, but likely the final too. 4) Bento has never once thrown a player under the bus even when the media did so (publicly defended Jang Hyun Soo… could have criticized several players for not scoring when they should have.. cough cough Hwang Heechan/Uijo, but still supports them). He at the very least appears to take care of his players. 5) Son Heung Min was outstanding today, didn’t really look tired to my eyes. Son actually looked disappointed when he eventually was subbed. Leading up to the game, he repeatedly said he was ready and not feeling more/less tired than usual. Maybe, like a professional athlete in the Premier League, he knows how to take care of his conditioning. 6) Sorry to say this because I know people love him, but if Lee Seung Woo doesn’t play, I give Bento the benefit of the doubt. If Lee Seung Woo is gonna throw a temper tantrum on the sideline, I think that says more about him than anything. Point #4 above, if Bento does have a problem with Lee, we haven’t heard anything about it. So yeah, put me in Bento’s corner. For everyone who is criticizing him for playing Son and not subbing him earlier… the result speaks for itself. Are we trying to find things to complain about? Also, do you realize that the entire 23 man squad, except for Son, has been playing together for about 2.5 weeks, and have already played 3 games together before today? And you realize that they have the knockout stage in the next few days, where things get A LOT harder? That’s not exactly a lot of time for the team to play together with Son. They need every opportunity they can get to practice/play together, and the clock is ticking. And it was not Bento’s choice, but the KFA and Tottenham, who agreed for him to miss the beginning of the tournament. Good for Tottenham, Son, and the KNT future, but not good for this tournament, and it is on Bento to work within the constraints while still doing what he can to win. So far everything is going according to plan. When something goes wrong, let me know. Seems to me that Bento and his coaching staff know what they are doing more than anyone else. Fans sometimes need to stick to licking their chicken and beer fingers and appreciate when the team is doing well, because they haven’t been this consistent in about a decade. Completely agree with Jon. Thanks Jon for the quality post. No reason for me to second guess Bento either. LSW better control himself. Very good pts, agree w/ everything (particularly about the overall good job Bento has done), or at least I get where ur coming from… except concerning Son. He’s already mentioned being tired twice since arriving in the UAE, right after landing & right after the game. This from the guy who said being tired was an excuse, but after intl break when he rested admitted it did him a world of good. He even wondered aloud about being left in so long. I’m thinking that explains the look of disappointment, and I can’t blame him. Very nicely written analysis! Bento has done very well with our national team so far and he needs to get more credit for his work. I also thought Son shouldn’t have played yesterday, but after reading what you wrote, it makes sense. Son is our main man and I hope he doesn’t overwork himself – He’s been playing almost twice a week for Spurs and one thing that happens to speedsters like Son is hamstring or muscle injury. Even Ki who didn’t play much for Newcastle is on the sidelines with such injury. I remember Park Ji-Sung used to always suffer from fatigue when he flew from England back to Asia to join up with the national team. Alex Ferguson wrote in his book that he and his medical team had to take care of Park whenever he came back from his travels because he would always come back with a swollen knee. This probably means he never had the proper conditioning and rest required for Asian players. With 5 days until the next game, I hope he can take some proper and needed rest. In terms of Lee Seungwoo, I really wanted him to get some minutes in this group stage. However, I think there’s something to be said about Steve Han’s water bottle tweet. He said it was all over Korean media. This is par for the course for the Korean media. While Lee Seungwoo is popular with most Korean fans, he hasn’t won over the media because he just doesn’t conform to how they expect a Korean player should behave. He’s been criticized for being too flamboyant and brash by these media types in the past and I just don’t think they’re gonna stop. It’s just sort of the older generation of Koreans not really happy with letting him be himself. I would imagine that Bento’s dealt with worse outbursts from players and can have a chat with Seungwoo to smooth things over. I also had some thoughts about why Bento’s not playing Seungwoo. I think it’s just that this is a big tournament and Bento is worried about Seungwoo’s experience. For example, when Bento’s got seasoned European vets like Ji Dongwon and Koo Jacheol to come off the bench, I can understand why he picks them. They’ve been there before and are ready for the scene. This is different from the Asian Games where Seungwoo was the perfect super sub because at the U23 level he’s still a lot more experienced than his teammates who were on the bench. This is most likely Ki, Koo, and Ji’s last major tournament so I understand why Bento wants to give them a lot of game time. I think the warning bells will go off if we’re in WCQ in the fall and still Lee Seungwoo doesn’t get minutes. At that point we can begin to ask if there really is a rift between the two. It makes sense to rest Son. This is not only coming from fans licking their chicken and beer fingers. Multiple past KNT coaches predicted that bento will and should rest Son. Past KNT players who have played in major tournaments all agreed that resting Son is the better idea. It’s okay to put coaches and players under the microscope. If the manager does something that is unpopular, he should either address it or fix it. Same goes for players. That is a part of the professionalism that is required. Glad Bento went for it. As I commented under the Kyrgyzstan article, the knockout stage draw was going to be more favorable by topping the group. Yes, Iran finishing in first was no guarantee over in Group D. Japan is also not locked in to win Group F (but I have a sense they will want to defeat Uzbekistan to avoid a Round of 16 match against Australia). The added rest and not having to travel as far are added bonuses. Didn’t get a chance to watch the first half today but caught a glimpse of the second. They looked a lot better compared to their last match. I just tried to spend some time searching for match statistics (specifically pass success %) to no avail, so I can’t corroborate this statement with the backup data but seemed like their passing was more crisp today. Son also infused such an offensive vitality to the lineup. He’s really coming into his own and a real game changer (especially against other AFC teams). I’m sure Bento was monitoring Son’s fatigue/jet lag/energy levels closely, but it didn’t appear to be an issue, so I don’t fault Bento on leaving him in necessarily. Also another clean sheet. Three matches, three clean sheets after the group stage (like in the 2015 Asian Cup). Refreshing to see Kim MJ score again (and looks like KNT finally threatening off set pieces). With that said, on to the knockout round. Each match now matters. Do or die. KNT can’t treat any opponent lightly. 4 matches left to win their first Asian Cup since 1960 and the first one on foreign soil since 1956. I can understand where LSW is coming from. he could have been more tactful and responsible but he flat out wants to compete. He isn’t being given the chance to. He is the only attacking player who has not featured. And the further you go in the tournament, the lower the chances. Why call him up if he is not going to be utilized? You think Koo wants to get subbed in with less than 5 minutes to go? That’s garbage minutes you can use to test out other players. LSW’s “tantrum” shouldn’t be taken so seriously. It happens and I guess it’s going to be on bento and his staff to address it the right way for that’s good for the team. It could quickly turn into bad vibes within the camp if it’s not properly addressed. Time will tell with Bento’s decisions. I agree that Son getting less minutes and Lee getting some minutes would have been the better move but who knows what’s going on in the locker room. Lee has shown he’s super competitive and he’s shown it during WC and the Asian Games as he wants minutes and the ball and takes the shots. I hope to see him on the pitch. Falling out of favor with a new coach this soon might have repercussions on both sides. Rest Son and risk losing/tying China and everyone gets 3 days rest before the next match or play Son on short notice for a good result and everyone gets 5 days rest? I think we understand what Bento did here. I could make this point #7 to my original comment. Just another example of Bento making decisions that work. This is a great discussion – super thanks for all the good points being made AND the constructive discussion that is heads and shoulders above the mud slinging/name calling that so often ruins online discussions of things. And for the record: I was drinking coffee for the match (though at 8:30 in the am in the eastern US, that’s to be expected 😉 However I was eating Korean fried chicken from Hmart during the Krygyzstan match – the ONLY time I’ve ever eaten chicken during a KNT game – so whoever was tongue-in-cheek referencing chicken or what have you- you got me there, lol! Late to the discussion – the thing I’ll add is that Bento surely should have credit where credit is due, there are a number of areas where Korea looks sharper (like tactics) than the KNT of previous eras/management, et al, but specifically to the discussion at hand, my sense is that in a perfect world where Korea had taken care of business in their first 2 group stage games more effectively, Bento would rather have had Son rest during the China match. In fact he mentioned pre-match that he was aware of recent Son’s playing minutes (90 min Monday) and was thinking about his condition seeing as he just flew in from London. That issue was on his mind, however he also saw the paucity of goals against minnows (apologies Philippines & Kyrgyzstan – you’re both on the up and up) as an X factor that he wrestled with. In the end, with input from Son on his condition, he opted for his inclusion. As I mentioned in the recap, the gamble indeed paid off, but the more I’ve pondered over the issue of long distance traveling, compact scheduling of games and its effects on international players, there is a higher risk of overload, with injury and/or burnout as possible outcomes. It didn’t happen, and for that we can all breath a sigh of relief – but the way the dice was rolled, count me as someone who wouldn’t have been surprised if catastrophic injury/misfortune fell his way. I’m still writing a piece on this very topic with some interesting data to share soon. I don’t know right off the bat what exactly led to Bento’s downfall as Portugal manager, but from the recesses of my mind, I think there was an issue with him overplaying his hand with Cristiano Ronaldo during one of the Euro tournaments in which Portugal crashed out early in (I should look that up now but I’m on the run). Now if I’m correct in that hipshot assessment – that was of course then and this is now, and Bento’s probably a more seasoned manager who has learned a thing or two since then. But there it is, it’s a lingering concern that in a long form tournament like this, improper rotation during the group stage will lead to fatigue of key players – players that need to be at the top of their game (and healthy) for Korea to go deep down the stretch. Condition coaching aside, I’m still remaining optimistic, but some of the things I’m looking specifically at is how he’s managing that aspect of the tournament. We will see. There’s a lot more I could say (including the idea that the zero goals conceded may be sort of an illusion based on who their group stage opponents were) but I’ll leave it at that. 대한민국 ya’ll! Son wasn’t tired at all since he performed really well. Now he has five days to relax and recover. Remember last time when Son was rested and the coach decided to rotate was during the Malaysia match where Son appeared as a second half substitute and Korea still lost 1-0. Definitely wasn’t referring to you in my chicken and beer comment or any of my complaints. The Tavern rocks. I was mainly criticizing the thousands of “experts” on Twitter that came out in droves during the game. I get annoyed by it and sometimes Korean netizens are the worst (but sports in general has a lot). It’s good that you report on what is going on, so I totally get why you brought it up, and it’s a fair discussion point. At least you wrote a full article with proper commentary and insight is all I’m sayin. Another issue I have with starting Son and playing him nearly full mins. Fatigue from crazy mins all add up. You have to remember, 2019 Asian Cup expanded from 2015. While he missed two early games…. if it was 2015 format, he is playing the whole tournament. On top of that.. while the next game is in 5 days, the games afterwards are all in 3 day span. That is grueling schedule.. especially for Son who had to play crazy mins for Spurs before he joined the squad. If Korea wants to win the whole tournament, you want him fresh in latter stage.. especially against the likes of Qatar, Aus or Uzbek and the final (whomever it may be). Unnecessarily taxing his body for short term gain .. is again, one can be highly critical of.. imo & for right reasons. Props to him for winning all group stage games. While it may have been one of the weakest group (not to mention,not even close to competitive compared to 2015 group) with 2 first time Asian Cup participants… Korea still won the group without conceding any. It was ugly.. but 3pts is 3 pts. It also means, they weren’t tested (especially the defense). His real test begins now…. as in, the real tournament has started. Hope Bento manages the team well & Korea wins the tournament. UAE is only four hours time difference to London. 4 hr time difference, 7+ hr flight right after playing full mins vs Manchester. Son was also close to playing nearly every 3 days for 2+ weeks before he joined Korea for Asian Cup. The grueling game every 3 day schedule continued for Son (this is on top of without a rest since summer of 2017) by starting him vs China. 5 day rest is a bit of a “breather” for Son but again, game every 3 day schedule continues if Korea beat Bahrain. Nearly month and half of game every 3 day schedule for Son when Asian Cup ends (if Korea reach the final). Son is exceptional player but he isn’t a machine. We also know fatigued Son isn’t very good… it is night & day in regards to his “form”. Naw I wasn’t thinking u were targeting us, it was a funny term re: armchair netizens. I just found it hilarious in that I’ve never eaten chicken during games, except for that one match vs krygzstan – with the midday kickoff here in the US east, it was close to lunch…thus: K Chicken. The one time I eat chicken and lo and behold – that observation comes out and I just laughed at the comedic timing! Personally it felt Seinfeld-ian! I think Bento did the right thing putting out a strong lineup and agree with your point Jon that Son did need a chance to gel with his teammates. I also wonder, how much of the decision to keep Son in after being up 2-0 was down to Son himself? Maybe he wanted to get a goal and find his scoring touch. Will be interesting to see what happens against Bahrain, if we’re up 2-0 will he still keep Son in late? On another note… how about those two goals from Kim Minjae??? I totally loved the China one in particular, not just because it killed any momentum China was going for, but also because I like to see our defenders contributing. For too long our team has needed more balance and I’m hoping this is the start of that. I always worry what will happen if Son or Uijo lose their scoring touch… who’s going to step up? I was streaming the Fox Sports Australian feed and the commentators actually said his goal reminded them of Harry Maguire for England in the World Cup. Not a bad comparison! Surprisingly, korean defenders always seem to score big during tournaments.